Story Massage can be a powerful medium for enabling young people and adults to share and explore their own personal story in a safe environment. The combination of narrative and positive touch offers a gentle way sharing life experiences, feelings and memories that may otherwise remain unspoken and unresolved. 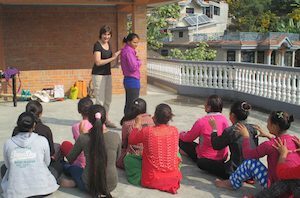 When Mary Atkinson, co-founder of Story Massage, was first invited to work with the Empowering Women of Nepal project in Nepal, she envisaged working solely with the disadvantaged children in the children’s home. 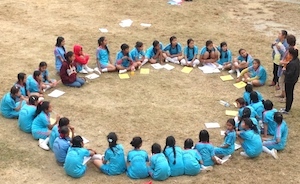 However, the staff were so excited about the possibilities of Story Massage that they invited her to introduce it as part of their GOAL programme in secondary schools in Pokhara. 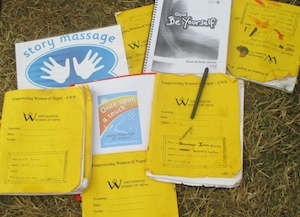 The team were soon working with the Story Massage book and developing their own ideas to incorporate it into their work. 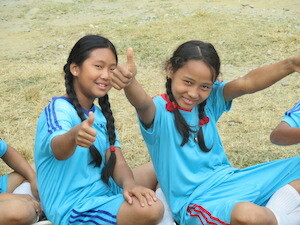 The GOAL programme is designed to empower and equip at-risk youths, especially girls, with valuable life skills as they deal with complex issues that are brought on by family, their peers and traditional society in Nepal. Young girls from ages 12-17 are selected to take part in the weekly programme which includes an hour of life skills followed by sports and other creative activities. Topics covered by the GOAL programme include dealing with peer pressure, learning to say ‘no’, trafficking, violence, knowing your rights, managing money, body image and contraception. 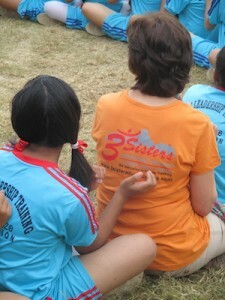 The girls are given clothes to wear, and offered orange juice, fresh fruit and snacks before the session begins. 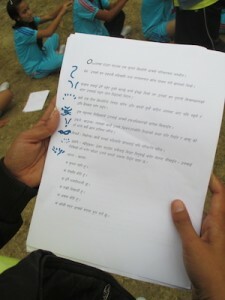 The session focussed on “Who Am I?” and “What I Can Do?” in life. Students were paired and they asked each other questions and talked openly to each other. 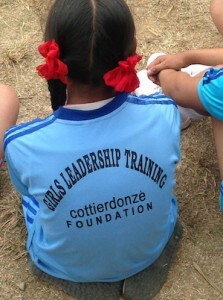 To build confidence, the facilitators asked the girls to close their eyes and to think of one thing they do best. Then they were asked about their future. What did they see themselves doing in the next 3 years? Where did they see themselves in 15 years? Although interrupted by such cultural norms as a cow wandering across the field (below) the girls were keen to participate in sharing life experiences through Story Massage. The session was attended by 35 teenagers who sat in a large circle in the grounds of the school (below). The leaders introduced our 10 basic Story Massage strokes and the girls had great fun singing Twinkle, Twinkle, Little Star in English and sharing the massage moves. Central to Story Massage is the principle of respectful and appropriate touch, and this is especially important for Nepalese girls living in a society where men traditionally hold the power. They were taught to ask permission before touching another girl, and to say ‘thank you’ at the end of the story massage. Mary also discussed using hand signals to offer feedback if the touch is too soft, or too firm – if it felt really good or if they they like it to stop. The girls were intrigued by these signs and chose to spend time practising and remembering them. Perhaps the most moving experience for Mary was being invited into the circle while the GOAL Leaders shared a massage story that they had written especially for the session using some of the Story Massage strokes. The massage story centred on the need for girls to know their rights and recognise their own value. In a country where most girls are married at a young age and have very few opportunities to improve the quality of their lives, this is an important message. Massage Story – Who am I? The girls became very animated as they shared the massage story and later spent time discussing their own vision for their future. It was very positive to hear that many girls saw themselves studying in the next three years. In the next fifteen years, some of them said that they would be working, some said they would probably be married with a family and a few of them showed interest to become life skills facilitators and work with children. Story Massage combines the benefits of positive, respectful touch with the creativity and engagement of storytelling. Ten simple massage strokes form the basis of the Story Massage programme. These strokes have a child friendly name, such as The Circle or The Sprinkle, and an easy to recognise symbol making it accessible for all. It is a fully inclusive activity, no clothing is removed and no oil is used. Stories can be taken from our Story Massage book, adapted from favourite stories, or you can learn to help others create their own stories. 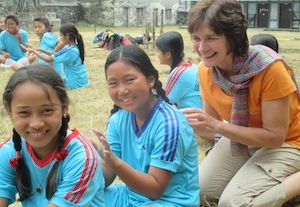 Are you inspired by the way that Mary has used Story Massage with teenagers in Nepal? Would you like to train to use Story Massage in your work or home? We run one day accredited training courses that is held around the country for individuals and groups. These days can also be organised as in-hosue training or group sessions. We teach you how to share the ten Story Massage strokes and work with you to adapt familiar stories and even create some sensory stories of your own. Ideal for teachers, SEN staff, support staff, therapists, Early Years practitioners, those working with people with additional needs, Baby Massage Instructors, Relax Kids Coaches… everyone with an interest in sharing positive touch activities for the health and well-being of children.